a Hospital bed Several repatriated OFWs suffer from physical abuse and maltreated abroad. Villar SIPAG’s ensure that they are in good health when they get back to the country. 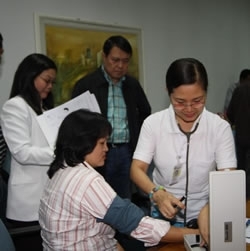 OFW Repatriates are given medical attention as soon as they get back to the country. One of them is Neneng delos Santos, a 41-year-old OFW from Riyadh, Suadi Arabia. She has five children. While working abroad she suffered from fallen bladder or cystocoele, due to carrying heavy luggages in her job. She was part of the batch that was sent home in 2009. Villar SIPAG facilitated and sponsored the repair of her bladder.